My 625JM was truly an 'impulse buy'. I caught it in the display case, the price seemed right so I bought it. I noticed 2 things right away, the typical smooth S&W action, and the grooved trigger. Dry fire wore me out at first. My first range trip showed it to be accurate, but I founds some moon clips wouldn't chamber fully. I had a mix of factory and reloads here. I checked some with a known 325PD. Some chambered in the 325. I called S&W and explained, ensuring they knew that some could be reloads, and the fault of the ammo, but they were happy to assist. WHILE it was there... I figured what the heck, and asked for guidance on Performance Center work. They suggested the Master Action Job for my needs. It includes a barrel crown, chamfering the cylinder chambers, and a detailed action job. Here are some pictures. 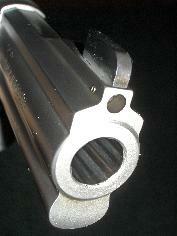 The barrel crown, after a range session.